Click to listen to episode (4:25). Unless otherwise noted, all Web addresses mentioned were functional as of 3-29-19. From the Cumberland Gap to the Atlantic Ocean, this is Virginia Water Radio for the week of April 1, 2019. This week, we feature a sporting mystery sound, from a game that experiences a popularity peak in the United States each March and early April. Have a listen for about 15 seconds, and see if you know the sport and what it might have to do with water. If you guessed basketball, you’re right! March and early April mark the height of the U.S. college basketball season, with bracket matchups, star players, upsets, and final fours for men and women in the NCAA Division I tournaments and the National Invitational Tournaments. Within those popular, pressure-packed sporting events, what’s the hardwood hydration story? It starts, of course, with the human body being made up about 60 percent water by weight, depending on several factors, including age, gender, and the percentage of a body’s lean tissue vs. fat. 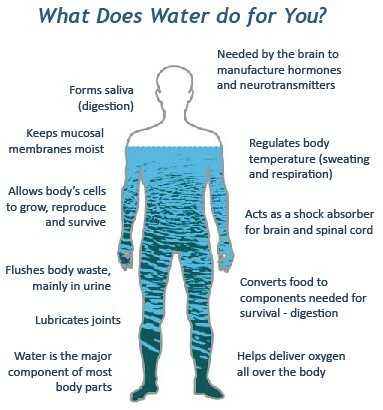 Water is the solvent for the biochemicals in the processes that make our bodies work, including the transmission of nerve impulses that generate muscular action. In athletes and non-athletes alike, an adequate level of hydration affects blood volume, chemical solutions, body temperature, energy production heart rate, cognitive processes, and emotions. For athletes, a deficit of water in the body, or dehydration, can significantly affect performance through those physiological and psychological impacts. Studies of basketball players, for example, have found impacts of dehydration on shooting percentage, sprinting, and lateral movement. 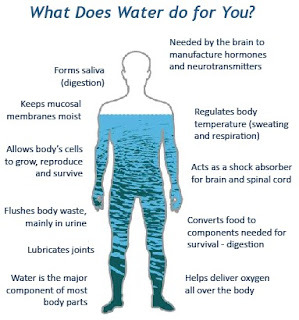 According to various sources, impacts of dehydration typically begin to be observed when one loses water equivalent to two percent of body weight. The exercise-induced sweating that results in that loss depends on the activity along with an athlete’s size, metabolism, clothing, and environmental conditions. Avoiding dehydration requires adequate fluid intake before, during, and after exercise. What’s adequate? The National Strength and Conditioning Association’s 2011 Guide to Sport and Exercise Nutrition recommended about one-half ounce of fluid per pound of body weight 4 hours before exercise, 3 to 8 ounces every 10 to 20 minutes during exercise lasting longer than 60 to 90 minutes, and, after exercise, 20 to 24 ounces for every pound of water weight lost. This may vary with individuals and with environmental conditions, and many sources may have other specific recommendations. But the overriding principle is as true as a perfect basketball shot: paying attention to fluid levels pays off in athletic performance as well as in everyday processes. So if you’re a basketball fan, next time you hear this – SOUND - ~4 sec - “One minute remaining…” – take a second to consider what effect water may have on the outcome at the final buzzer. The first basketball sounds heard in this episode were recorded March 26, 2019, by Virginia Water Radio at Virginia Tech in Blacksburg. The college basketball game announcer sound was taken from “Fans at a college basketball game,” by user phillyfan972, dated November 29, 2017, no location identified, made available on Freesound.org at https://freesound.org/people/phillyfan972/sounds/412160/ for use under “Creative Commons 0 License (public domain). For more information on Creative Commons licenses, please see https://creativecommons.org/licenses/. Thanks to Tommy Cianciolo and Clay Word, graduate students in the Virginia Tech Department of Forest Resources and Conservation, for their ideas and suggestions on this episode. Image from U.S. Geological Survey (USGS) Water Science School, “The water in you,” online at https://water.usgs.gov/edu/propertyyou.html. Luca P. Ardigo et al., Effect of Heart rate on Basketball Three-Point Shot Accuracy, Frontiers in Physiology, Vol. 9, Feb. 2018, accessed online at https://www.ncbi.nlm.nih.gov/pmc/articles/PMC5808225/, 3/26/19. Lindsay B. Bake, “Hydration Science and Strategies for Basketball,” Gatorade Sports Science Institute, July 2017, online at https://www.gssiweb.org/sports-science-exchange/article/sse-165-hydration-science-and-strategies-for-basketball. Andrew Carlton and Robin Marc Orr, “The effects of fluid loss on physical performance: A critical review,” Journal of Sport and Health Science, Vol. 4/Issue 4, December 2015, pages 357-363, accessed online at https://www.sciencedirect.com/science/article/pii/S2095254615000046 (subscription may be required for access at this site). K. A. Dougherty et al., “Two percent dehydration impairs and six percent carbohydrate drink improves boys basketball skills,” Med. Sci. Sports Exercise, Vol. 38/No. 9, Sep. 2006, pages 1650-58, accessed online at https://www.ncbi.nlm.nih.gov/pubmed/16960527 (subscription may be required for access at this site). Judy A. Driskell and Ira Wolinsky, eds., Macroelements, Water, and Electrolytes in Sports Nutrition, CRC Press, Boca Raton, Fla., 1999. Heather Hedrick Fink et al., Practical Applications in Sports Nutrition, Jones and Bartlett Publishers, Sudbury, Mass., 2006. Jay Hoffman, Physiological Aspects of Sport Training and Performance, Human Kinetics, Champaign, Ill., 2002. DeAnn Liska et al., “Narrative Review of Hydration and Selected Health Outcomes in the General Population,” Nutrients, Vol. 11, No. 1, Jan. 2019, online at https://www.mdpi.com/2072-6643/11/1/70/htm (subscription may be required for access at this site). Caroline Mandel, “Stay hydrated, stay safe,” 5/2/12, ESPNHS Build a Better Athlete Series, online at http://www.espn.com/high-school/features/build-a-better-athlete/story/_/id/7874491/proper-hydration-tips. National Strength and Conditioning Association, Guide to Sport and Exercise Nutrition, Bill I. Campbell and Marie A. Spano, eds., Human Kinetics, Champaign, Ill., 2011. Marissa Payne, Here’s why LeBron James may have cramped up when no one else did, Washington Post, 6/6/14. M.P. Schwellnus, “Cause of Exercise Associated Muscle Cramps (EAMC)—altered neuromuscular control, dehydration, or electrolyte depletion?” British Journal of Sports Medicine, Vol. 43/No. 6 pages 401-408, June 2009; accessed online at https://www.ncbi.nlm.nih.gov/pubmed/18981039 (subscription may be required for access at this site). All Water Radio episodes are listed by category at the Index link above (http://www.virginiawaterradio.org/p/index.html). See particularly the “Science” subject category. Following are links to other episodes on water and the human body. Episode 450, 12/10/18 – on the human nervous system. The episode—the audio, extra information, or sources—may help with the following Virginia Standards of Learning (SOLs). 2.1, 3.1, 4.1, 5.1, and 6.1 – Current applications to reinforce science concepts. K.7 – basic needs and processes of plants and animals. 1.5 – animals’ basic needs and distinguishing characteristics. 5.5 – cell structures and functions. LS.1 – understanding of scientific reasoning, logic, and the nature of science, including current applications to reinforce science concepts. CH.1 – current applications to reinforce science concepts. CH.6 – chemical properties in organic chemistry and biochemistry. Episode 250, 1-26-15 – on boiling, for kindergarten through 3rd grade. Episode 255, 3-2-15 – on density, for 5th and 6th grade. Episode 282, 9-21-15 – on living vs. non-living, for kindergarten. Episode 309, 3-28-16 – on temperature regulation in animals, for kindergarten through 12th grade. Episode 333, 9-12-16 – on dissolved gases, especially dissolved oxygen in aquatic habitats, for 5th grade. Episode 403, 1-15-18 – on freezing and ice, for kindergarten through 3rd grade. Episode 404, 1-22-18 – on ice on ponds and lakes, for 4th through 8th grade. Episode 406, 2-5-18 – on ice on rivers, for middle school.